Cardiac arrest is the sudden loss of function of your heart due to a problem with its electrical system. If treatment is not received within minutes, the condition is fatal. Here is an overview of what you should know about cardiac arrest, including symptoms, causes, risk factors, diagnosis, and treatment. 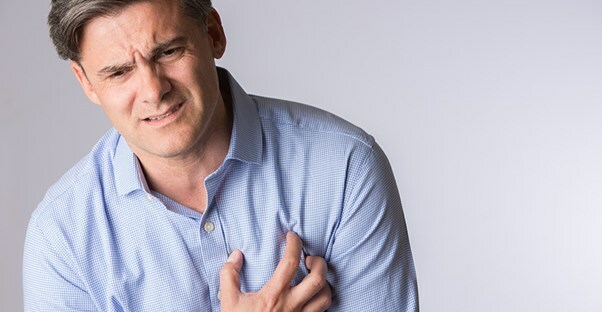 In most cases, symptoms of cardiac arrest develop suddenly, but it is possible to experience some warning signs and symptoms. Symptoms of cardiac arrest include loss of consciousness, unresponsiveness, lack of pulse, and lack of breathing. Warning signs that can occur beforehand are chest pain or discomfort, shortness of breath, nausea, or vomiting. Cardiac arrest is caused by an irregular heartbeat (arrhythmia). The specific type of arrhythmia that leads to cardiac arrest is called ventricular fibrillation. During ventricular fibrillation, the ventricles of your heart quiver rapidly. This causes the heart to pump little or no blood. Underlying causes of ventricular fibrillation include coronary artery disease and birth defects. Cardiac arrest is usually diagnosed after it happens, because it occurs without warning and requires emergency treatment. Diagnosing cardiac arrest is done by ruling out other causes of your sudden collapse. Two common diagnostic tests that help discover the factors that put you at risk for cardiac arrest are an electrocardiogram (ECG) and echocardiography. An ECG is a basic test that detects and records your heart’s electrical activity. It can show disturbances in heart rhythm and detect irregular electrical patterns. An echocardiography is painless test that uses sound waves to create images of your heart. From the images your doctor can see the size and shape of your heart and how well your heart chambers and valves are working. Blood tests will be done also. Samples are tested to check the levels of magnesium, potassium, hormones and other chemicals that can affect your heart function. Cardiac arrest is a medical emergency and requires immediate treatment. When someone collapses due to cardiac arrest, CPR should be done until a defibrillator, which sends a shock to the heart, or medical professional become available. Once recovered, your doctor will put you on heart medication to reduce your chances of cardiac arrest occurring again. You may also need an implantable cardioverter-defibrillator (ICD). This is a battery-powered device that constantly monitors your heart rhythm and send a shock to your heart if a dangerous rhythm is detected. An ICD is implanted near your collarbone. In some cases surgery is needed. A coronary angioplasty is a procedure that opens and widens blocked coronary arteries, restoring blood flow to normal and reducing your risk of cardiac arrest. Coronary bypass surgery which involves sewing veins or arteries in place at a site beyond an impaired artery is another surgical option.